We love having people over for a meal and games. Over the years I’ve developed a few go-to recipes so I don’t have to think about planning a menu each time. I can just pick from one of the preplanned menus. This really helps reduce the stress of entertaining. 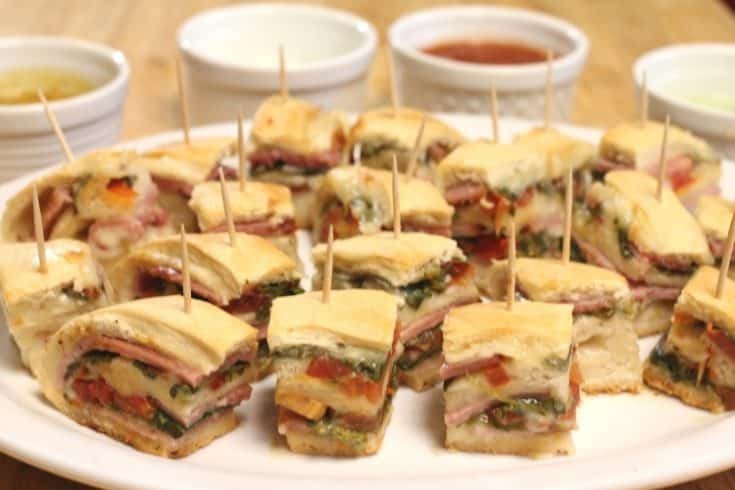 We recently added a new item to the preplanned menu options that everyone seems to love….ham and cheese stromboli bites. Oh, you’ve never heard of stromboli bites? Me either until we made it up one Sunday evening. I’m taking part in Frick’s Quality Meats Recipe Challenge and when they sent me ham for an appetizer I knew I wanted to make something that would be great to serve for a variety of parties. Something both kids and adults would like. Something that could double as a main dish if I needed it to. And something that could be made ahead so I can enjoy our company too. Stromboli bites fit the bill perfectly. For stromboli dough I use my pizza dough recipe. It works great and I have it memorized – it’s enough for two stromboli. You can buy already made pizza dough and if you do you’ll need about 1.5lb dough per stromboli. I used Frick’s smoked applewood ham and provolone cheese. You can use any cheese you like but know that some cheeses will release their oil more than others. For instance, when we’ve made stromboli with Swiss cheese it gets really greasy because Swiss releases it’s oil very easily. I love adding spinach and arugula to stromboli – I just can’t serve something without greens in it! However, be careful about adding too many ingredients that have a lot of moisture or you’ll end up with a soggy stromboli. For stromboli bites, you want it kind of firm. 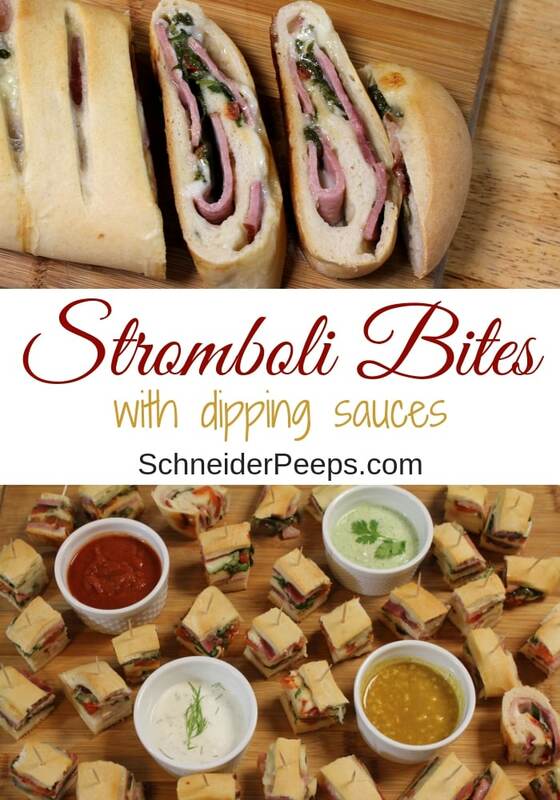 There are printable recipes for the stromboli bites and the dipping sauces below but I’ll share a few tips for the process under each photo. For each stromboli I used 1.5 lbs of pizza dough, 1 lb Frick’s smoked applewood ham, 8 oz provolone cheese, 2 chopped tomatoes, 3 oz arugula/spinach mix. 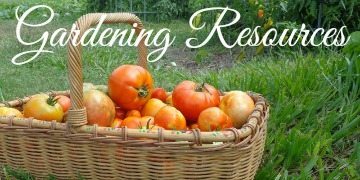 I like to use paste tomatoes (Roma or Juliet) for stromboli because they have less moisture than slicing tomatoes. Roll out the dough until it’s pretty thin. Rolling out pizza dough isn’t the same as rolling out a pie crust – pizza dough tends to shrink back up a bit after each roll. So, it will take a several passes to get the dough to the desired thickness. I’ve found that if I put just barely sprinkle the counter with flour the dough sticks a bit to the counter and doesn’t shrink back as much. Top the stromboli dough with the ham and then the cheese. 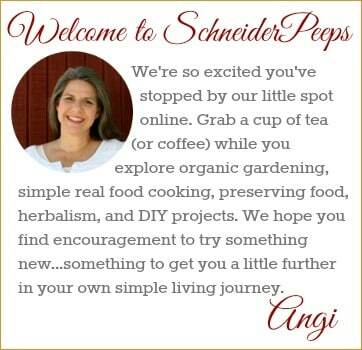 Don’t go all the way to the edge, leave 1/2″ – 1″ of space. 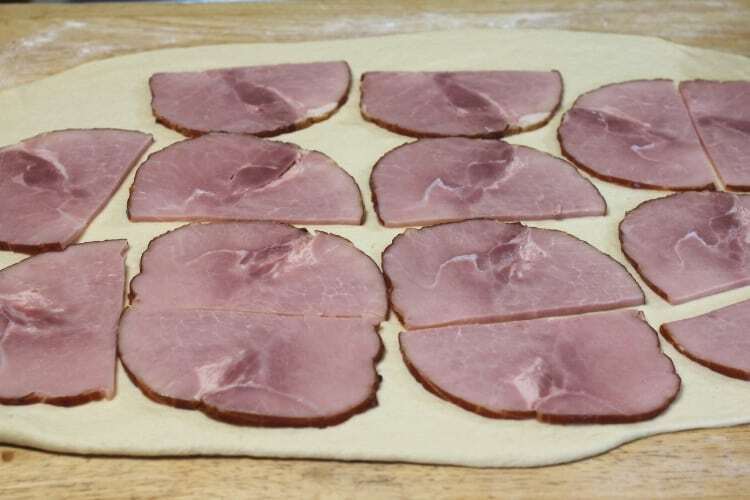 I like to have the ham against the dough because we’re going to cut slits in the rolled stromboli and if the cheese is next to the dough, it melts out. After the cheese put the arugula/spinach mix and tomatoes on top. You could also put onion or even mushrooms. Just don’t put too much. For cutting into bites, the stromboli needs to be firm. 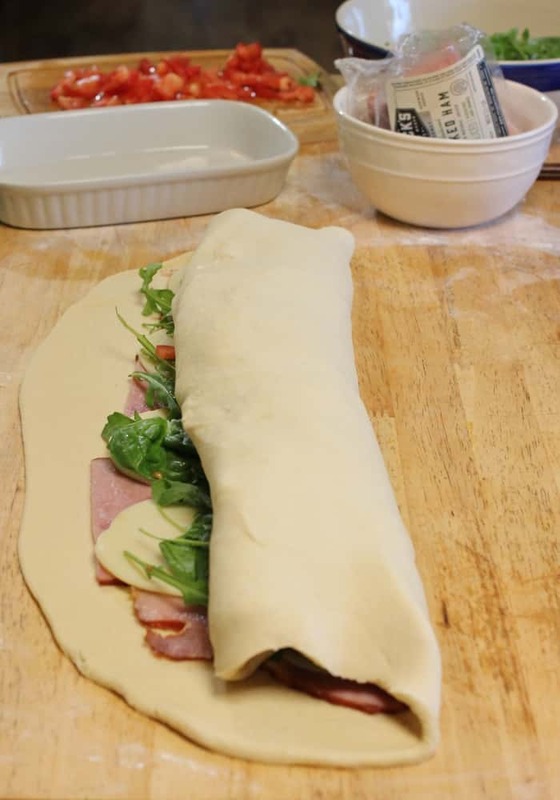 To roll the ham and cheese stromboli start at one long end and gently lift the side and lay it over the filling. If find it best to kind of hold the filling in while I’m lifting and folding. If you try to just roll it up, the filling will slide to the other side and you’ll end up with a bunch of filling hanging out….and we can’t have that. This is the second roll. I usually just roll it twice. Then I brush the edges that aren’t rolled yet with water. Then instead of rolling the stromboli, I lift the unrolled edges and put them on top of the rolled part. Then I pinch all the seams shut. Brushing the stromboli dough with water helps the seams stick together. I move the ham and cheese stromboli to a large baking sheet that’s been oiled and cut slits across the top. These slits will help the stromboli vent and it also makes cutting the baked stromboli easier. I’ll use the slits as a guide for cutting the stromboli into slices. Most people brush stromboli with an egg wash but I just use milk. Two tablespoons of milk is cheaper than an egg and I think it still browns just fine. Bake the stromboli at 400°F until golden brown (about 20-25 minutes). Remove from oven and put on a cutting board to cool. 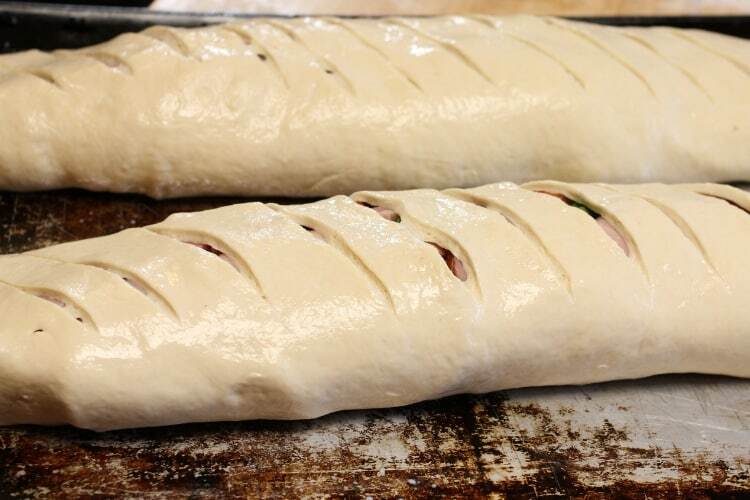 Let the stromboli cool for at least 5 minutes before cutting. This will allow the filling to firm up a bit. 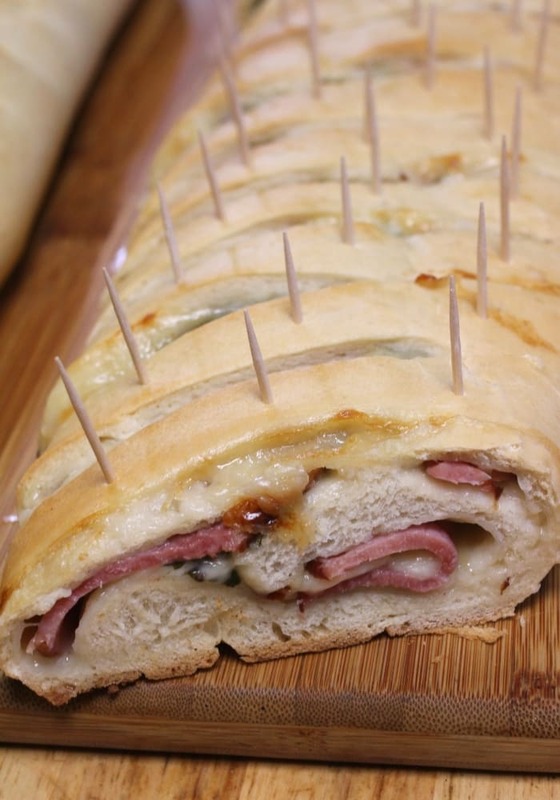 If you’re serving ham and cheese stromboli as an entree just slice using the slits as a guide. If you’re serving stromboli bites as an appetizer put 3 or 4 toothpicks in a row in between each slit. Then you’ll cut using the slits as a guide. 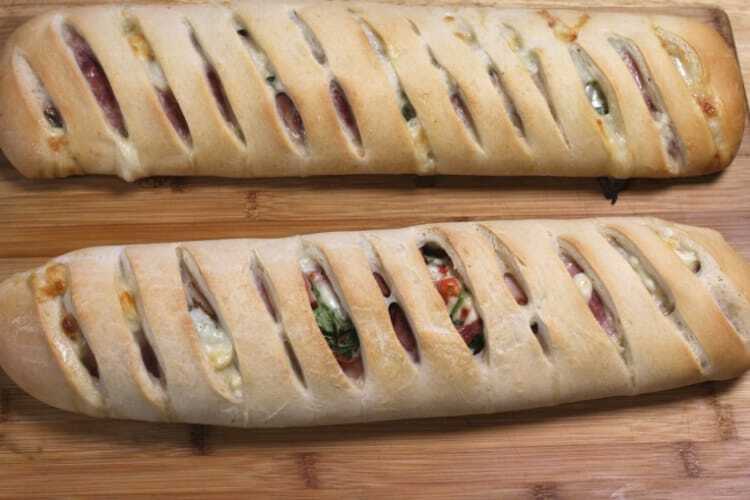 Then cut each stromboli slice into 3 or 4 bites with a toothpick in each bite. Serve with a variety of dipping sauces. 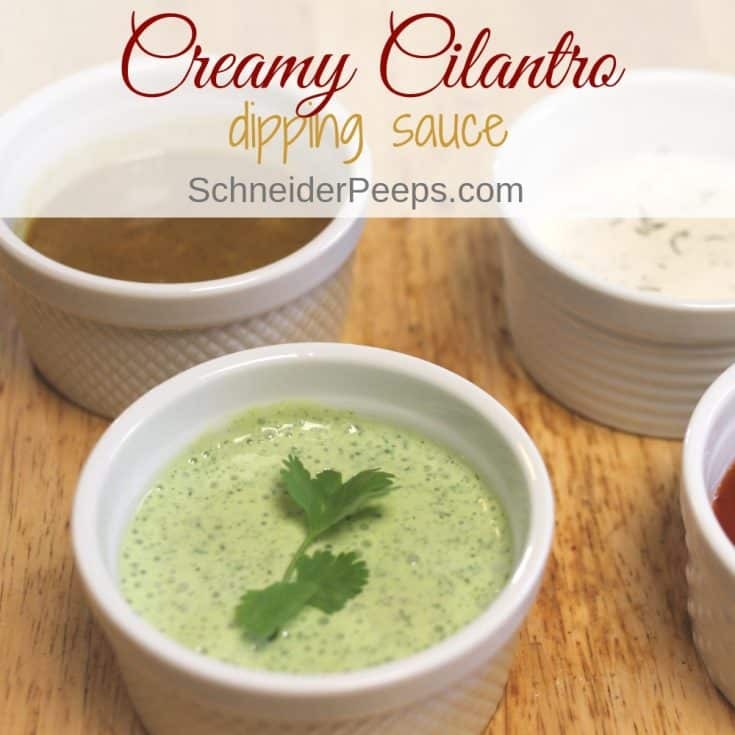 I like to make spicy honey mustard, creamy dill, creamy cilantro, and a red sauce. The dipping sauce can (and probably should) be made a day or two in advance. This gives the flavors time to really blend together and one less thing for you to do on the day of the party. If you don’t want to make dipping sauces you could just use store bought spaghetti sauce (which is what we do for the red sauce) and ranch dressing. The first time I made stromboli bites with dipping sauces my family was a little leery because not everyone likes tomatoes and I’m the only one who really likes arugula. Then there was the issue of not liking dill because “I don’t like pickles” and, well you get the idea. The joys of cooking for a large family! But I’ve learned a few things over the years and so has my family – just because we *think* we don’t like something doesn’t mean we don’t like it. These ham and cheese stromboli bites are enjoyed by all – even those who don’t like tomatoes or arugula. And surprise of all surprises my husband, the notorious pickle hater, likes the creamy dill dipping sauce the best. 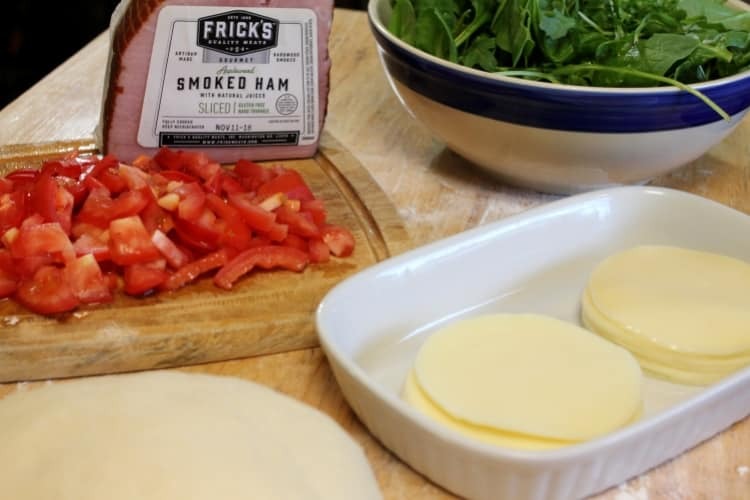 When I told a friend about this recipe using Frick’s smoked ham she said, “Oh, we love Frick’s. Even my husband who doesn’t like ham, loves it.” And there you go. 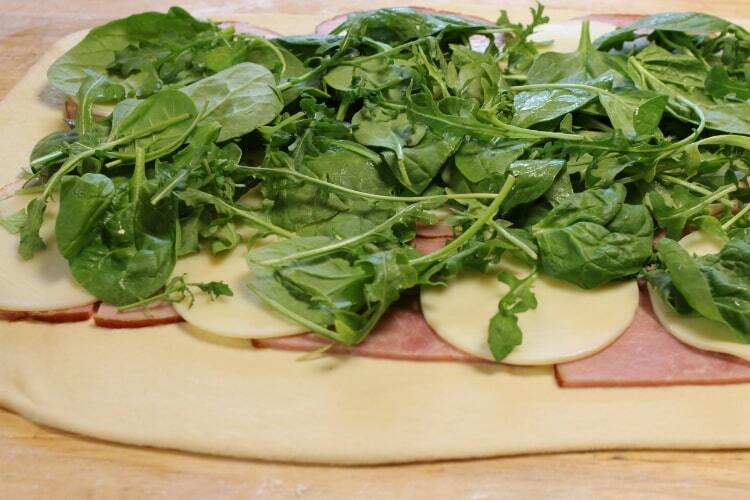 So, don’t be afraid to try new things….like arugula on your ham and cheese stromboli. 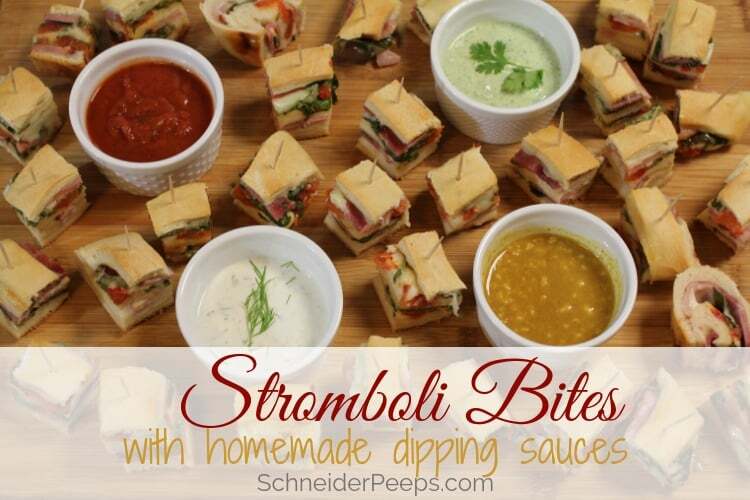 Stromboli bites can be served as an appetizer or as an entree for a crowd. Combine water, yeast, and sugar in bowl for stand mixer and let sit for 5 minutes until bubbly. Stir in three cups of flour, olive oil, and salt, just mix with a fork. Put bowl on stand mixer and add remaining flour. Put dough in a well oiled bowl and let rise for 40 minutes or until doubled. Roll out the dough until it’s pretty thin - 1/4 inch thick or so. 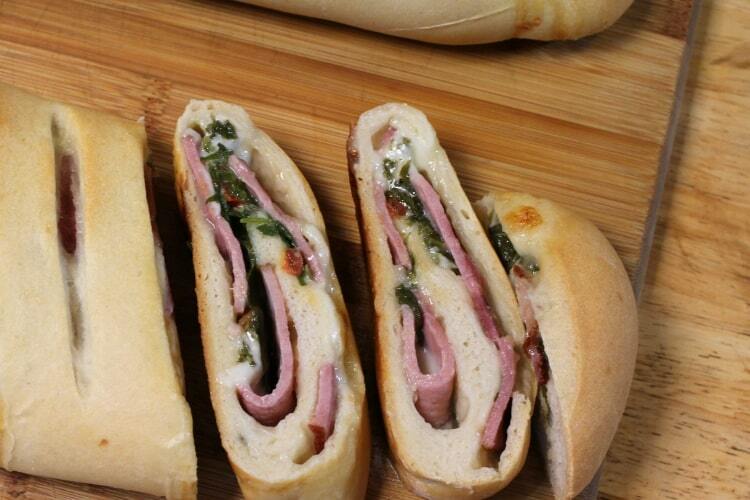 Top the stromboli dough with the ham and then the cheese. 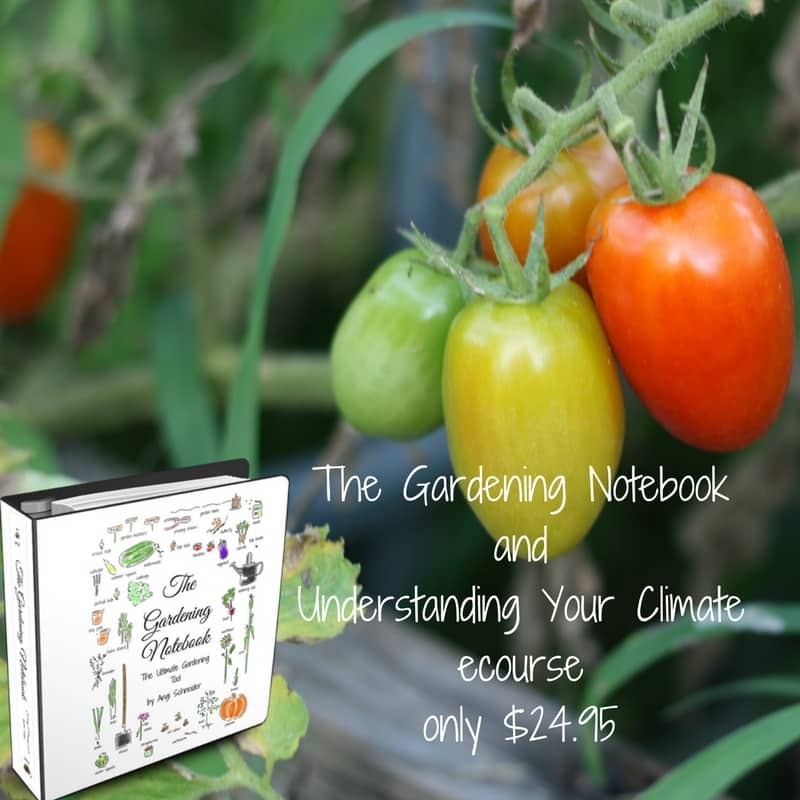 Don’t go all the way to the edge, leave 1/2″ – 1″ of space. 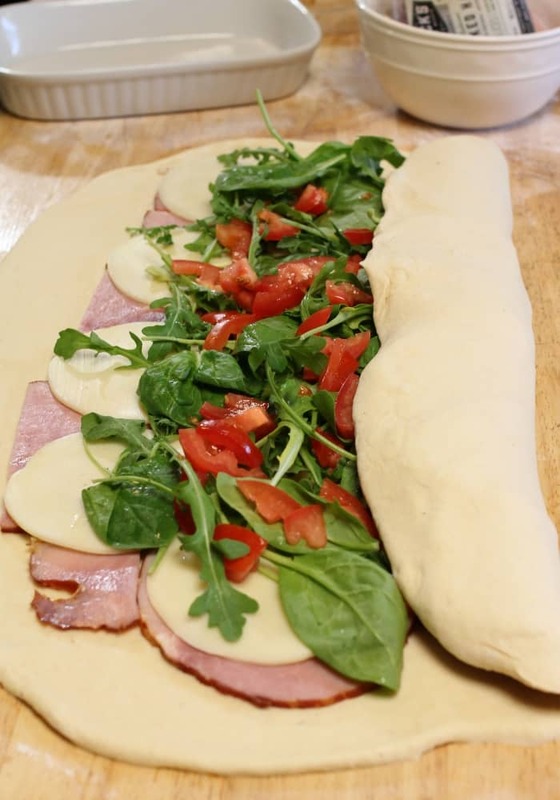 Roll the ham and cheese stromboli - start at one long end and gently lift the side and lay it over the filling. Hold the filling while you fold it. If you try to just roll it up, the filling will slide to the other side and you’ll end up with a bunch of filling hanging out….and we can’t have that. Fold it one more time - it won't be completely rolled at this point. Brush the edges that aren’t rolled yet with water. Then instead of rolling the stromboli, lift the unrolled edges and put them on top of the rolled part. Then pinch all the seams shut. Brushing the stromboli dough with water helps the seams stick together. 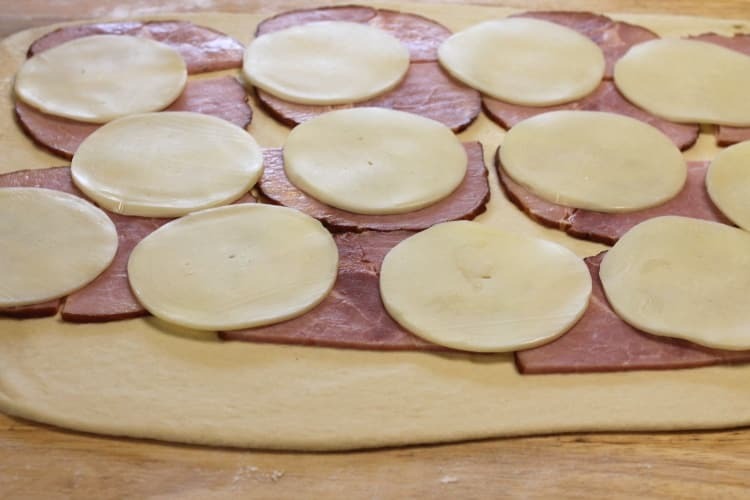 Move the ham and cheese stromboli to a large baking sheet that’s been oiled and cut slits across the top. These slits will help the stromboli vent and it also makes cutting the baked stromboli easier. Brush the stromboli with milk or a beaten egg. Bake at 400 degrees F until golden brown (about 20-25 minutes). 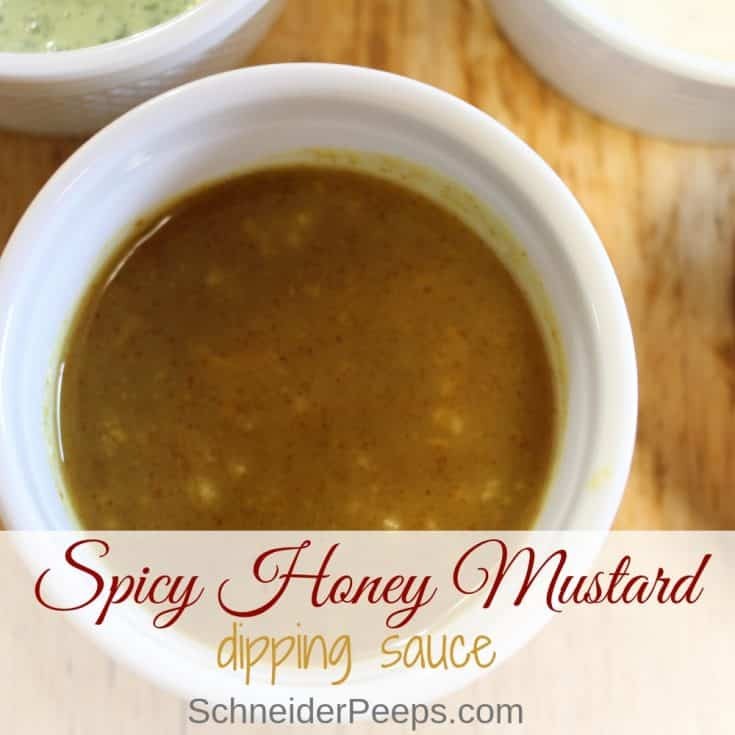 This spicy honey mustard dipping sauce is great served with appetizers or drizzled on a salad. Combine prepared spicy mustard, honey, apple cider vinegar and fresh minced garlic in a small bowl or mason jar. Let sit for at least an hour before serving. This sauce can be made several days in advance and stored in the refrigerator. 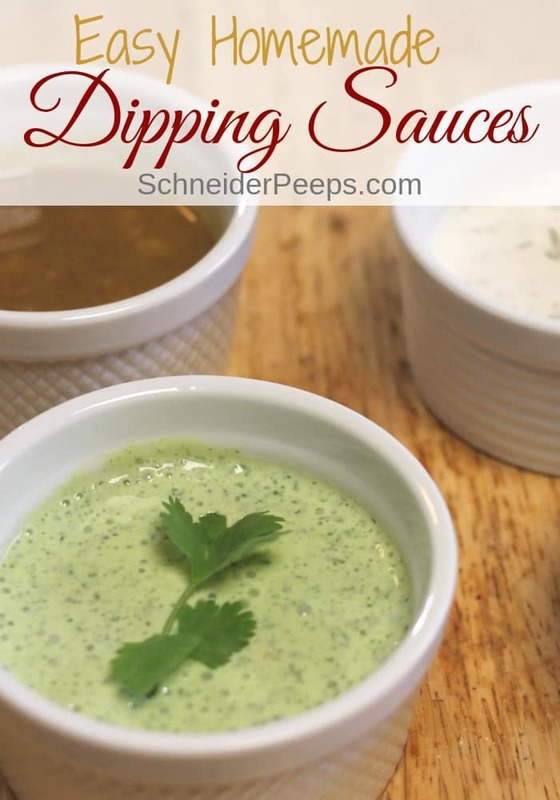 This creamy cilantro dipping sauce is great for appetizers or to drizzle over tacos and burritos. Using an immersion blender mix sauce until it's mixed well. Let stand in the refrigerator for at least an hour before serving. This can be made a day or two in advance and stored in the refrigerator. 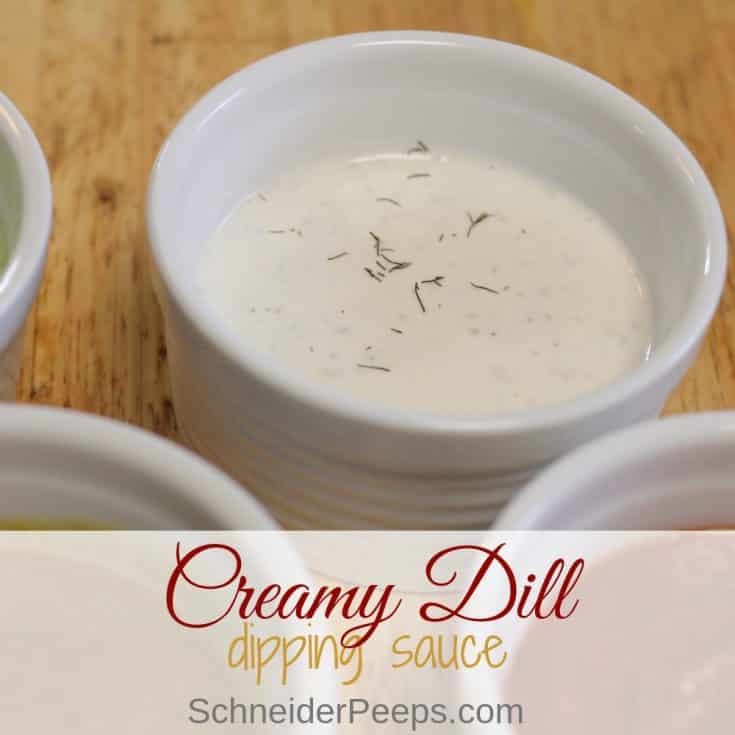 Creamy dill dipping sauce can enhance the flavor of any appetizer or can be drizzled on a salad for a healthy dressing.